We were looking forward to trying this type of coffee and it would be our first experience with a coffee from Thailand. 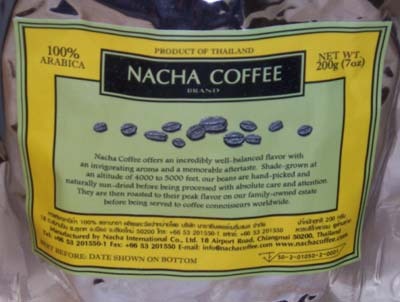 Nacha Thai (also known as Nacha Original) is described as an Arabica Typica coffee that has won international and SCAA cupping competitions and is bringing worldwide renown to Thailand and Nacha Estates. It is a versatile coffee and can be used for Phin or French Press, drip, or even espresso. The Nacha bean is very stable and keeps for longer than an ordinary bean. It is a medium-dry bean that works well in all grinders. These coffees are grown with high concern for the ecology and all are sold by the producers themselves, so they net all the proceeds. You know we use three different brewing methods in tasting the coffee and then compare the results. The Nacha Thai has a mild aroma and I was a little surprised since it is a darker bean. Even while brewing in the Chemex there was only a slight earthy aroma. The flavor though was very tasty; it reminded Kim of eating toast which is one of her favorite breakfasts. It tastes good black and has a mild tangy acidity. It has a light body in your mouth and a clean aftertaste. Two thumbs up. I did something a little different, but I’ll get to that later. Next up was the French Press and here the aroma was stronger and the taste was bolder. Even though it seemed the taste was amplified there was no bitterness and the body felt fuller but still smooth. It has an earthy flavor to it. This was Kim’s favorite way to enjoy the coffee. She thought it mixed well with the dried cranberries she was eating. She was also thinking of other foods to pair this coffee with. Two thumbs up again. Lastly was the auto-drip and after the last two tastings we were a little disappointed. Maybe I’m not preparing the coffee correctly, but it was very mild and had very little aroma here. It felt very smooth and light in your mouth and the aftertaste was gone quickly. This was our least favorite method of brewing and tasting. We learned something new to do when tasting coffee and I tried it during our Chemex taste. A friend of ours (let me give a shout out to Jonathan) said to let some coffee sit and cool down or put it in the refrigerator and drink it cold and then taste the flavor profile. I am not one for iced coffees but I am one for learning and trying new things. So I made extra coffee and put it in the refrigerator. It really had a deep, bold, strong earthy flavor. Its tangy, spicy flavors are more pronounced and it needs no sweeteners. It made an iced coffee believer out of me. We are looking forward to sharing this coffee with friends, even iced at picnics. Nacha Thai is available at www.vietnamese-coffee.com. We received this coffee for free and offer objective feedback. Would you and Kim interest to try our coffee?